Amid recent hype about "freedom of navigation" in the South China Sea, the US, an outspoken opponent of China's "militarisation" has been flexing its own military muscle by sending naval vessels and aircraft carriers to the region. Four questions need to be answered to clarify the the real situation. First, what is freedom of navigation? According to international law, ships navigating in the territorial waters of countries other than their own must meet the "innocent passage" requirements of the United Nations Convention on the Law of the Sea (UNCLOS). That means not using force or threatening the use of force, and not engaging in military exercises or intelligence gathering. Although naval ships are not subject to UNCLOS provisions of innocent passage, they are required by many countries to obtain prior permission or provide advance notice to enter foreign territorial waters. Such is the provision of China's Law on the Territorial Sea and the Contiguous Zone. So, freedom of navigation is not an absolute freedom to sail at will. The US Freedom of Navigation Programme should not be confused with freedom of navigation that is universally recognised under international law. The former is an excuse to throw America's weight about wherever it wants. It is a distortion and a downright abuse of international law into the "freedom to run amok". Second, is there any problem with freedom of navigation in the South China Sea? The reality is that more than 100,000 merchant ships pass through these waters every year and none has ever run into any difficulty with freedom of navigation. Despite some disputes between China and some of its neighbours, maintaining stability in the South China Sea has been a matter of consensus for all the countries in this region. The overall situation has been stable, thanks to the joint efforts of all the regional partners. Last August, for example, the foreign ministers of China and the Association of Southeast Asian Nations (ASEAN) countries agreed on the framework of a code of conduct. The parties have agreed to hold at least three more rounds of consultations before the end of this year. The South China Sea is calm and the region is in harmony. The so-called "safeguarding freedom of navigation" issue is a bogus argument. The reason for hyping it up could be either an excuse to get gunboats into the region to make trouble, or a premeditated intervention in the affairs of the South China Sea, instigation of discord among the parties involved and impairment of regional stability. The third question concerns militarisation of the South China Sea? The US, the self-professed opponent to "militarisation", keeps sending destroyers, cruisers, carriers, reconnaissance flights and strategic bombers, fully loaded with advanced offensive weapons to this region in total disregard of others' sovereignty and security or the peace and stability of the region. What is "militarisation" or "troublemaking" if not this blatant show of force? Instead of getting this straight, some countries followed suit by condescendingly accusing China of "not playing by the rules". This is not only making a mess of the regional situation but also assisting the troubemakers. China is naturally vigilant and on guard against provocations and needs to increase its defensive capabilities, such as building necessary facilities on its islands. This is the responsibility and right of a sovereign country. These facilities, while serving the purpose of safeguarding the sovereignty and security of China, will also provide relevant navigational services to ships and aircrafts passing through this region and help ensure the openness and safety of the shipping and flight routes. China is the biggest littoral state in the South China Sea and it is firmly committed to peaceful development, to peace and stability in the South China Sea and to regional prosperity and growth. There is no doubt about this. The last question is what does it take to ensure peace and stability in the South China Sea? A calm and tranquil South China Sea matters directly to the prosperity and development of China and its neighbours, who treasure peace and stability in this region more than anyone else. Therefore it is up to China and the ASEAN countries to find a solution through negotiation and consultation among themselves. Peace, like air and sunshine, is hardly noticed when people are benefiting from it. But no one can live without it. China respects and supports freedom of navigation in the South China Sea according to international law. But freedom of navigation is not the freedom to run amok. 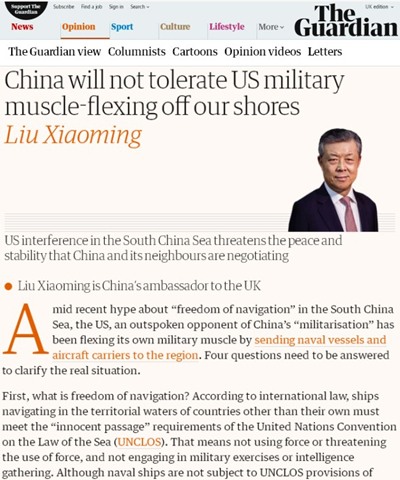 For those from outside the region who are flexing their muscles in the South China Sea, the advice is this: if you really care about freedom of navigation, respect the efforts of China and ASEAN countries to safeguard peace and stability, stop showing off your naval ships and aircrafts to "militarise" the region, and let the South China Sea be a sea of peace.